L:O for Linux and Mac! Discussion in 'Modifications' started by Robbz, Feb 17, 2013. 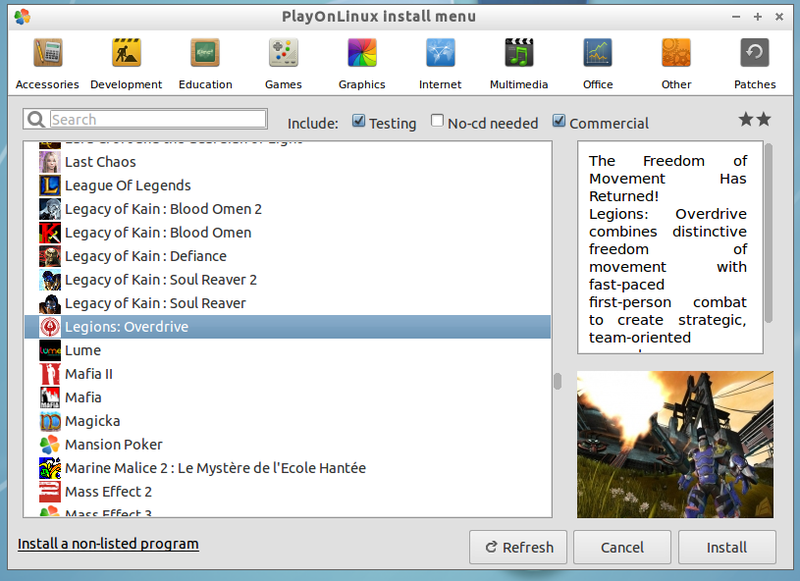 I just finished with the PlayOnLinux Devs and its is now its is officially supported on their client! But on top of this awesome news they also added support for there PlayOnMac client for macs as well! Be sure to try it out today! Remember there may be a bug or two but at least its on there for them to perfect the bugs out of! Also until its perfected its ONLY FOR LIVE, not public test. Instructions: Once you download your client open and go to install. After your there click games. Thanks to all the Devs here from legions that helped me with my questions on teamspeak! Piggeh, Armageddon, k e v i n and 6 others like this. Go there to see it added to this list! Thanks for testing this out man. I do not have mac so I can't test that side. Also explain buggy. It's nice to report what's bugs to fix it. Keep in mind this was only for live and not public test. And lastly, this is hand made by me and pdq not found. Update: Legions has been taken off testing and is now supported fully! Voltage, WildFire and k e v i n like this. Tested it out on both a Mac and a Linux system and I must say, good job! Tested it out and I must say, good job! was there any bugs you you saw? Not really, though I didn't have much time to look into proper details, was at the youth centre near my college and quickly gave it a go. The game ran, that's all I have for now. Hope you like the new installer look! Also I would like to note that the installer has been used over 100 times! Now to complete this I need 2 good high resolution gameplay screen shots to put on there website! If someone could PM me some of there best screen shots I would very much appreciate it. Can the devs please put a link to this on the download page, and write that there is Mac and Linux support on the FAQ page? I'm sure that at least 10% of people who stumble upon this game will have a mac, and that's a playerbase that we can't afford to lose, nor can we expect them to find this thread on their own. He said it not me, but I must agree! A link to this thread has been added to the Download page and the FAQ has also been updated. Great job guys. Robbz and Royalty like this. HOLY CATS! NICE! Thanks Bugs! I tried this on my newer laptop, the game locks up a lot and the frame-rates are terrible and not playable.. Your not genuinely running it on Linux, they use the wine emulator and windows software to make it work. The download was larger too, about 500mb of extra software from windows. 1. Sorry to hear about that, It doesn't work on every UI for linux but in my trials, most did. 2. 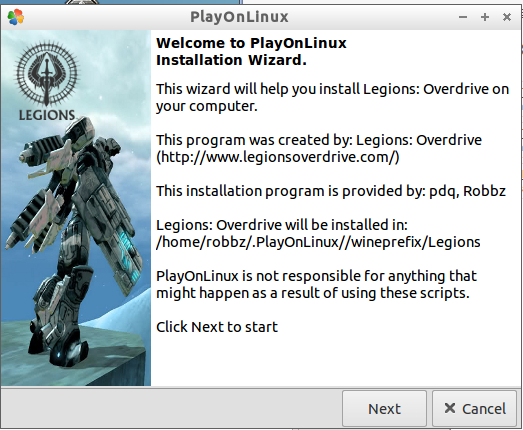 Its very true, PlayOnLinux uses wine, By default so does Legions. To try and help your problem I would need to know what linux distro your using. Hit me up with a Pm and I will help you out, maybe even modify the script to fix your bug (most likely if your having problems, others are too). Sorry guys its been a while since I have been around. Its built on the latest Ubuntu. My video card drivers are the Ubuntu default ones for ATI Mobility Radeon. I think I tried the experimental driver with this too, but my google-earth stopped working, so I went back to the old driver. My laptop boots both windows and Linux, no big deal, I can still run legions if I need too..
At the time, I wanted to run it on my laptop to use the map editor, not play the game.